The perfect choice for a dynamic and contemporary workplace, our Campos office furniture comprises a versatile collection of desks, benches and storage solutions that are perfect for both open plan and traditional work settings. Campos office furniture is accentuated by fun and vibrant coloured panels in hues such as red, light blue, orange and yellow, as well as a sleek and neutral white. 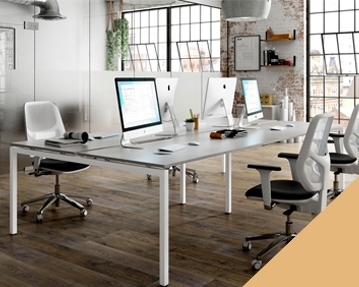 Made of melamine faced chipboard, Campos office desks are lightweight enough to easily move into different configurations, while also being durable and reliable. 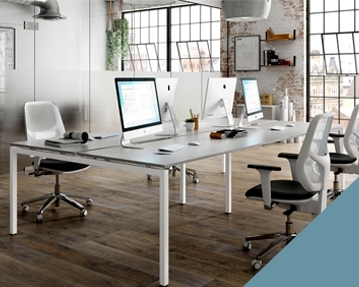 Our Campos desks are supported by lightweight A or H frames in silver or white, and adjustable feet to complete the look and to ensure your comfort. Campos office desks can also be accessorised with pedestals of different styles and dimensions. 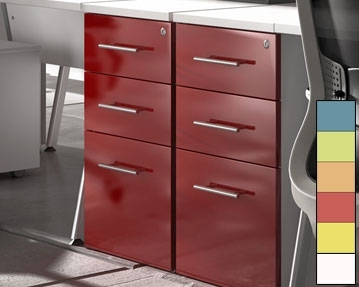 Storage - including filing cabinets, cupboards, tambour units and bookcases - is available in the Campos range, with accents of Campos’s distinctive style and colour always noticeable. We are proud to offer the Campos range with a 10 year warranty. If you think this may be the collection you’re looking for to brighten up your workplace, get in touch with one of our experts now. Contact us via our online form today, or why not give us a call?